Having a NEW STUDENT lunch bunch for students who are new to your school at the start of your year. Having a WELCOME TEAM to welcome new students all year long. At the start of the year, I email teachers to see who is new to our school. I then set up a time to meet with all of the new students in each grade level. Click here to see lunch bunch invitation I send out. Kids love it for oodles of reasons: they bond with the other “new kids”, they love being selected for a special lunch, and this is a great way for me to establish a rapport with them. This is a team that is established about the 3rd or 4th week of school. A Welcome Team consists of 2 kids per class that come and greet new students on their first day of school. You know the situation…. a student enrolls mid-day and the school secretary calls into the class that a new student is here. Cue… the Welcome Team Members from that class. These 2 Welcome Team Members will come down to greet the new student, walk the new student up to class and serve as the go-to friendly faces as the new student transitions to school. A Welcome Team works well in my school (with about 25% transiency rate) and I would recommend it as an easy to implement school-wide program for any school except one with a super high transiency rate where your enrollment is a revolving door which would make it more difficult. First, an email is sent to teachers requesting that they email you 2 names from their class of students that are friendly and kind (this is a great chance to get the well-behaved kids who might fall through the cracks of being recognized to have a leadership role). Next, the counselors have a one-time training session with the WELCOME TEAM. We invite 1st through 5th graders to be Welcome Team members. Kindergartners are obviously too young for this… but 1st graders feel oh-so important to be able to do this. Click here for a Welcome Team letter we send home to parents. A child-friendly Welcome Booklet (download by clicking) that can be given to new students to take home and share the information about their new school with their families. 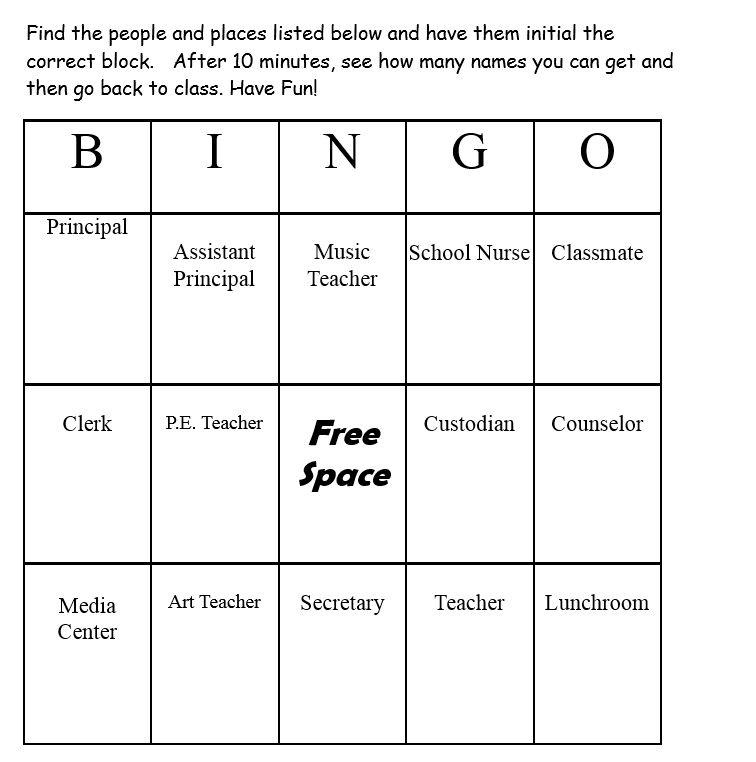 New Students can learn the important people in the building through a BINGO game. The beauty of this program is that is serves two great purposes. 1) It makes your school a more welcoming place to your new students 2) it provides leadership opportunities for students who get to be on the WELCOME TEAM. Next → Next post: How do you handle individual referrals?